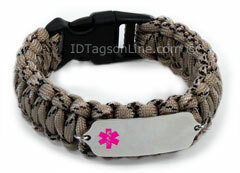 Camo Desert Paracord Medical ID Bracelet with Pink Emblem. Camo Desert Paracord Medical ID Bracelet with Pink Emblem. Premium Medical ID Dog Tag with Red emblem (6 lines engraved). Camo Desert Paracord Medical ID Bracelet with Pink Emblem. Camo Desert Paracord Medical ID Bracelet, IDPR52 (ID Tag size 1-5/8" x 7/8"), features .062" thick premium grade non allergenic surgical Stainless Steel Plaque. It is guaranteed to be rust free for life. The medical logo comes in Pink.